Everyone needs it, but not everyone has it, so the drive to acquire money is extremely pressing for the second category of people. Unfortunately, not all money is acquired through legitimate means, so the need for appropriate security technology is critical in reducing risks. The two greatest examples of extreme-level security protection in the financial services industry are the Federal Reserve Bank in Manhattan and the U.S. Bullion Depository, commonly referred to as Fort Knox. The vault at the Federal Reserve Bank is safeguarded by a comprehensive multi-layered security system, highlighted by a 90-ton steel cylinder protecting the only entry into the vault. The 2.7-metre-tall cylinder is set within a 140-ton steel-and-concrete frame that, when closed, creates an airtight and watertight seal. Also, once closed, four steel rods are inserted into holes in the cylinder and time clocks are engaged, locking the vault until the next business day. So cautious are the custodians of this facility that no human hands touch the pallets of gold – they are remotely moved around the facility by robots. Fort Knox is considered the most secure location on Earth and is the home of 5000 tons of gold. The vault, housed within a deep basement, has a 22-ton front door and a number of known security defences. In addition, it is speculated that numerous other security measures, including a sophisticated biometric access control system, integrated with extensive sophisticated surveillance cameras, ensure that no unwanted people enter the facility. While not all registered financial service providers (RFSPs) are quite as rigid with their security measures, there is an increased focus on securing access to safes, vaults and registers as well as other sensitive areas such as server rooms and counting rooms. In addition, financial institutions are seeing the benefits of integrating time and attendance (T&A) software with access control hardware for a more accurate accountability with regard to employees. Since crime (theft) and fraud (of funds and employee time) are the two biggest challenges that RFSPs face, often a multi-modal approach to risk mitigation is required. According to John Powell, managing director of Powell Tronics, the company regularly deploys both biometric and RFID access control solutions to the RFSPs in South Africa and beyond its borders. The aim is to provide or limit access to sensitive resources or services, prevent identity theft and fraud, and meet the RFSP’s regulatory requirements. He highlights the use of Morpho’s contactless user interface technology for the financial environment, where non-tactile interfaces are often preferred. The MorphoWave frictionless biometric solution captures and matches four fingerprints with a single hand movement. This is especially useful for ensuring fast flow-through of employees, simultaneously ensuring heightened security levels and reducing bottlenecks. Using the latest thrift protocol technology, the Morpho Sigma range is another weapon in the RFSP’s arsenal for providing enhanced security through its anti-spoofing capabilities. Finally, the Morpho 3D Face readers are gaining popularity as a hands-free access tool to high-security areas such as safes, vaults and server rooms. The embedded matching engine analyses the structure of the face using over 40 000 data points and the enhanced accuracy enables low false acceptance rate, while maintaining high throughput and productivity. In order to capitalise on the efficacy of the biometric technology, Powell Tronics has developed a range of software that provides full integration and heightened return on investment. Web-based ATOM allows RFSPs to manage employees remotely, creating a highly productive T&A environment. 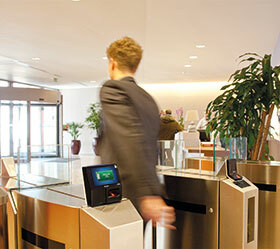 Available in three desktop-based variants, as well as in mobile format, the software increases flexibility and leverages Powell Tronics’ experience in access control in a number of markets. Powell Tronics has also deployed a number of its PT-AD systems into the financial sector through its dealer base. By incorporating MS Active Directory into the ImproNet access control system, the system is able to institute a higher level of access control management in terms of linking Internet and IT access to physical access to specific employees. Powell Tronics is effectively using its integrated access control systems to verify not only the identity of RFSP employees, but also of customers. This allows the customers to access financial services such as service subscription, contract signature, and authentication to withdraw money at an ATM or before payment, via a biometric authentication platform. “Since no two organisations are identical, we work closely with customers to customise solutions that address specific needs, whether it be restricting access to protected areas or sensitive data, as well as creating a beneficial and accurate time and attendance environment,” Powell concludes.